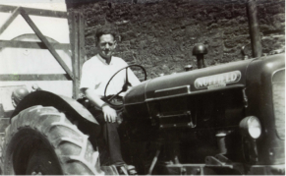 The original family farming business in Angus was started in 1954 by James Brunton Snr, a butcher by trade, and his son Hugh upon his return from national service in Berlin. James bought Crudie Farm beside Arbroath whilst still in partnership with his brother Eddie at their butcher shops in Colinsburgh and Elie in Fife. There had been four or more generations of butchers serving this coastal area of Fife. auto-weighers replacing swing balances. Irrigation was introduced to all parts of the farm in the late 1970’s following the drought of 1976. Boreholes and dams were used to supply the water to the fields. Cold stores were built in the 1980's to extend the length of time potatoes could be kept for whilst improving their quality without the use of any chemicals. Many different crops have been grown over the years including daffodils, for flowers and bulbs, and blackcurrants for a few years. No livestock have been kept for over 30 years and all straw is now incorporated to help with the soil structure. Land was bought when possible leading to economies of scale. In 2001 the first field was rented in Easter Ross to grow potatoes. This has grown year on year to become a major part of the business. The construction of a 6000 tonne cold store with grading facilities in 2011 cemented our position in the area. In 2012 renewable energy was used in the business for the first time. Wind power generated by J Scott & Partners on Fearn Farm is fed directly into our coldstores. In April 2011 Douglas and Robin decided to split the old family business with James joining Douglas in the new business.